It's slowly becoming more common for wireless operators to let traveling users surf the Web and access email and apps via LTE networks, but the practice is nowhere near ubiquitous. 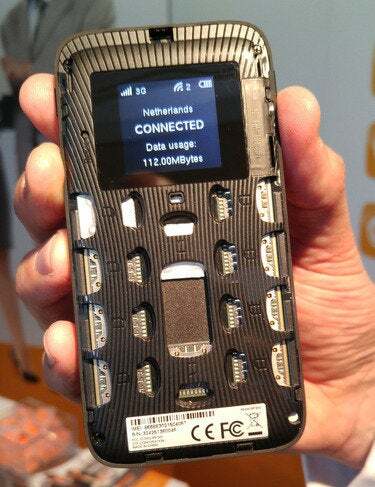 Enter the Goodspeed 4G mobile hotspot, which was launched and demoed this week at the LTE World Summit in Amsterdam. The Goodspeed 4G hotspot can switch automatically between 10 SIM cards to offer LTE roaming around the world. The device is the world's first commercially available 4G hotspot that can accommodate and switch automatically between 10 SIM cards, making it easier for travelers to cross borders, Uros said. Users only need to do two things to use it: switch it on and charge it, according to Tom Lindblad, vice president of global sales and marketing at Uros. Only the SIM cards provided by Uros can be used.